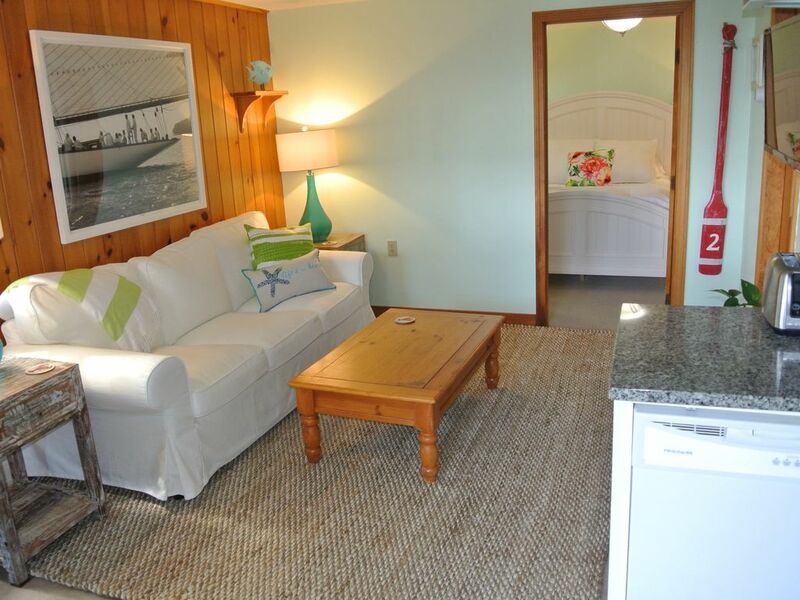 Cute, furnished, first floor, 1 bedroom 1 bath guest house at Willard Beach. Great for a single person or couple to enjoy some time in Maine. Enjoy water views and close proximity to the beach. The guest house is 2 rooms, plus a newly installed galley kitchen with granite counter top and dishwasher and a full bath. We live in the main house next door so are available if you need anything but certainly won't hover as we work a lot in the summer running the local ice cream shop. The beach is about 100 feet from the front door. You can hear the waves rolling in at night and smell the salty sea air coming in from the windows. Enjoy a quiet vacation while blending in with the locals at Willard Beach, South Portland, Maine. Willard Beach is a small, mile long, sandy neighborhood beach with beautiful views of Casco Bay, the islands and the ship channel that leads to Portland Harbor. Watch the cruise ships come into Portland from the porch. Stroll in the sand at dawn and see the local fishing boats head out to sea. Soak up the sun and salty sea air at South Portland's best-kept secret!! Walk to local restaurants such as Joe's boathouse, David's or one of two wonderful neighborhood bakery/coffee shops. There is also a gourmet ice cream shop a short walk away. Drive three miles to Portland's Old Port district which offers shopping, night life, and a variety of outstanding restaurants. Take the Casco Bay Lines ferries to local islands for biking, dining, or exploring. Short drive from I-295 which leads to Freeport, Maine, home of the world famous L.L. Bean and numerous outlet stores. Jen and Paul Leddy, Willard area locals and business owners. Great location, great scenery, a well maintained rental. Small cottage with an awesome view! A very comfortable cottage and close to restaurants as well as downtown Portland. Steps away from the beach with chairs provided. Can walk to Scratch Bakery. Easy pathway by the college for morning walks. Good restaurants such as Big Fin Poke, North 43 Bistro, The Corner Room. Location and view could not be better! The location close to the beach and in a quiet neighborhood was wonderful! The view of the Casco Bay and the ships coming & going constantly was totally mezmerizing! You could watch the sunrise at about 4:30 a.m. from the bungalow windows. The bed was very comfortable, fluffy pillows and nice bedding. The bedroom has two big closets and nice furniture for storage. Small kitchen area,but adequate for two people. The bathroom has a kitchen sink installed, which was kind of odd, but it worked. There is a musty odor throughout the unit that improves when windows are open and the fresh air is circulating. My husband and I sat on the beach, with the beach chairs provided, in the evenings and watched the dogs frollicking in the waves. So relaxing and peaceful! Although I never met Jen, she was always available by text. This was our first (we hope) of many trips to this perfect vacation spot. The hosts provide all that you need to make your stay comfortable and the decor is perfect. The provided HD television includes all the channels you could possibly want to see. The bed was very comfortable and sleeping with the sea air was easy in the very quiet neighborhood. The best part though is the view of the water and the short walk to Willard Beach. Everything about our week was great! Great little place for 2! Had an amazing time and owners were awesome! Our 4th time vacationing in this perfect spot for two adults. Weather was perfect as well. there is a business nearby that offers stand up paddle rental and lessons. Looks like fun!